María Rodrigo: Becqueriana, Rimas infantiles, La copla intrusa. 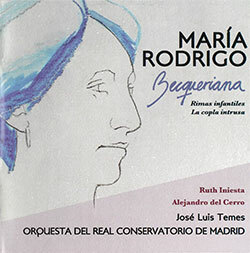 Ruth Iniesta (soprano), Alejandro del Cerro (tenor), Coro de voces blancas María Rodrigo, Orquesta del Real Conservatorio de Madrid, c. José Luis Temes. Some composers have all the luck, and some have less. María Rodrigo seemed to have none at all. You could say that the her bad luck started at birth. Madrid in 1888 was anything but a heaven of equal opportunity; and although the fourteen-year-old child prodigy graduated with the highest honours in piano and composition from the Conservatoire, winning scholarships for further study in France, Belgium and Germany, the young woman found that making her mark as a composer was almost beyond even her outstanding talents. 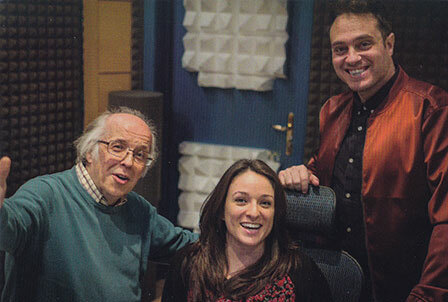 The outlet Rodrigo found as an educator – perhaps inspired by her friendship with the equally passionate Carl Orff, a fellow student in Munich, or perhaps self-induced as a psychological insurance policy – sustained her. Whatever the reason, her pedagogic work in Madrid, which lasted until she left the country during the Civil War, subsidised her creativity for over twenty years. Friendships with Joaquín Turina and (through him) the influential Serafín and Joaquín Álvarez Quintero led to occasional opportunities, whether as a rehearsal pianist at Teatro Real or as a composer. 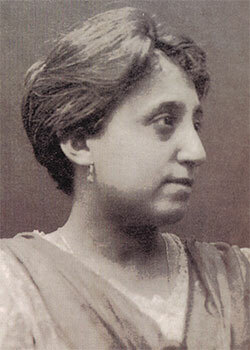 Of the stage works she wrote with Los Quinteros, two survive: the one-act opera Becqueriana (1915) recorded here, and the one-act zarzuela Diana cazadora from the same year. A third collaboration – Canción de amor (1925), apparently a work she herself valued highly – seems to be lost. Lost, along with much else that she wrote. Bad luck kicked in again, when she and her sister Mercedes fled the country in the spring of 1939, and the trunk containing all her music was lost en route to Geneva. The rest of her life was spent as a music teacher, first in Colombia and later – after another flight from bloody, local strife – in Puerto Rico, where she spent the last 17 years of her life, alonside other Spanish exiles such as Pablo Casals and Francisco Ayala. She died fifty years ago in 1967, almost completely forgotten in Spain. —¿a mí me buscas? —No; no es a tí. —a mí me llamas? —No; no es a ti. no puedo amarte. —Oh, ven; ven tú! my soul is filled with longing for pleasure. One man, three allegorical women, and a choice … but anything further removed from Paris’s apple and the three Goddesses from La belle Hélène it is impossible to imagine. The Quinteros’ tastefully respectful expansion of the poem, set in a Danteque ‘bosky wood’, is not quite an opera, more a cantata for the theatre of the mind. It provides short vocal opportunities for The Poet and three female soloists, plus two choruses for juvenile wood nymphs and a long, central ballet of ‘genies and spirits’. The effect for me is oddly Baroque, reminiscent of Handel’s The Triumph of Time and Truth and similar semi-sacred oratorios such as his Choice of Hercules, which ask us to meditate on a moral – or here, psychological and aesthetic – debate played out in music. So what is María Rodrigo’s music like? It is conservative in idiom, unfailingly fresh and lucid, reminiscent at times of her contemporaries Richard Strauss and Puccini, but most of all of her mentor Turina in its Andalusian grace and rich, harmonic melancholy. Her talent for fluent word-setting produces natural, memorable vocal phrases, grateful to sing and easy on the ear. Occasional rough edges to the orchestration and in harmonic technique hardly detract from the positive impression left by a composer who certainly knows how to create an involving (if not especially personal) sense of music theatre. The performance is good, anchored by the lyric tenor Alejandro del Cerro in excellent voice as a bright, open yet vulnerable Poet. I can understand that having the soprano superstar Ruth Iniesta on hand provided irresistible logic for the idea of her playing all three of the women, but perhaps for the sake of the work temptation should have been resisted. The three spirits are only subtly differentiated musically, and require contrasted voices to emphasise that they are three aspects of the whole. Having only one singer stifles the theatrical aspect of the drama, especially in the brief stichomythia for Passion and Tenderness at the climax of the first scene. Iniesta is predictably splendid, her light yet warm lyric soprano well suited to Rodrigo’s seductive phrases, but she can’t convey musical differences where none really exist. Only in the final scene, where Illusion has the floor to herself, does the action fully take flight. I liked the sound of the children’s chorus (and Rodrigo’s charming nymph-music) enough to forgive their marginal tendency to sing under the note; and despite some occasional intonation slips of their own, the Royal Conservatory’s orchestra execute their important role with honour: the long, central ballet of woodland spirits comes across with attractive grace. With José Luis Temes supporting a passionate belief in the score with his admirable conducting technique, Becqueriana emerges as more than an absorbing novelty, another entry in that impressive list of short Spanish operas which mark out a special theatrical territory. 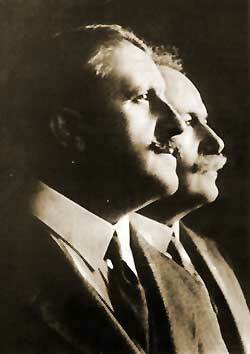 The two orchestral works which round out the disc are not so complex, but share the opera’s attractive clarity. The symphonic metamorphosis of five children’s songs Rimas infantiles (1930) inevitably brings to mind Guridi’s masterly cantata Así cantan los chicos from fifteen years earlier, especially as Rodrigo uses some of the same songs, and evokes a similarly potent mix of melancholy and sunny energy. La copla intrusa (also 1930?) was intended as a ten-minute mime piece attempting something unusual, by presenting an Andalusian tavern scene interrupted by a man from Aragon, who insists on singing a copla based on his own, local jota. The composer makes a light point by cleverly bringing the two, contrasted musical styles together. The result is a delight, all the more piquant for an occasional seasoning of bi-tonal humour in the manner of Falla’s Three-cornered Hat. This little work pinpoints María Rodrigo’s intelligence and generosity. She wears her learning lightly, and her technical dexterity ensures that her music communicates strongly and clearly, with the minimum of fuss. There is not a wasted bar in any of these three scores, which encourages me to second Enrique Mejías García’s plea for a timely revival of her surviving comic zarzuela, Diana cazadora. If that proves as good as the three works here, perhaps a change of fortune may be on the cards for their unluckily neglected composer.